In just the last 30 years, molecular biologists have discovered genes with the potential to extend longevity: SIR2 in yeast and its mammalian equivalent, SIRT1. In animal models, SIRT1, via the enzymes it encodes, has been shown to have healthspan extending regulatory effects on metabolism, stress resistance, cellular survival, cellular senescence, inflammation-immune function, endothelial function, and circadian rhythms. Clinically relevant findings first began to appear in the peer-reviewed medical literature a mere 10 years ago with the revelation that the keys that unlock and activate our longevity genes are naturally occurring dietary polyphenols. Part I of this review highlights key historical high points of the research odyssey that cracked the longevity code and provides the reader with a backstage pass to meet the enzymes encoded by SIRT1—the seven nutrient-responsive NAD+-dependent histone deacetylase enzymes, dubbed the sirtuins. Part I’s interview with these intriguing enzymes provides answers to the following questions: What are the unique nutrient requirements of the sirtuins? How and why is their activation impacted not only by calorie restriction, but by certain phytonutrients such as resveratrol, and by the redox state of the cell, specifically its NAD+/NAD(H) ratio? What can be done to optimize this ratio via NAD+ salvage, and why will this—in conjunction with resveratrol and/or other SIRT1-activating compounds–optimize sirtuin activity? Why might a very recently discovered niacin-related compound, nicotinamide riboside, be a better sirtuin-activating partner for resveratrol than niacin (nicotinic acid) or its derivative, niacinamide? Part II of this review details SIRT1’s anti-aging effects via an overview of the primary functions of key regulatory proteins deacetylated by Sirt1 and the mitochondrial sirtuins (sirtuins 3-5). 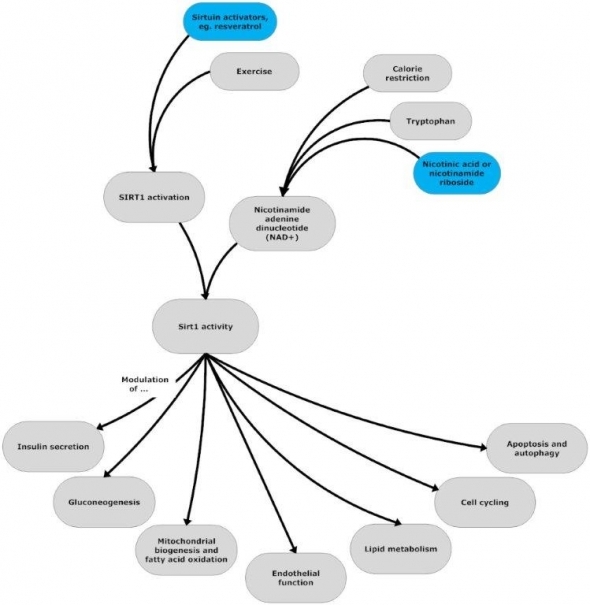 Even the brief overview provided demonstrates why the sirtuins, nicknamed “the magnificent seven” have also been dubbed “the master switches of metabolism.” Although resveratrol’s beneficial effects are primarily mediated through its activation of SIRT1, resveratrol’s cellular targets also include a number of other important regulatory enzymes including cyclooxygenases, lipooxygenases, kinases, ribonucleotide reductase, adenylyl cyclase, aromatase and DNA polymerases. The potential impact on healthspan of resveratrol’s modulation of the activity of these extra-sirtuin targets is outlined. Lastly, a number of other naturally occurring dietary polyphenols have lately been recognized to be sirtuin activating compounds (STACs); these, and their common mechanism of action, are noted. We have entered a new era in which the key genes and intracellular pathways responsible for aging and longevity have been identified. Our discovery of the sirtuins – and the fact that their activity is responsive to changes in cellular metabolism and a number of xenohormetic plant compounds –has proven that lifespan is tractable. Not only is the research progressing at an exponential rate, but, right now—today, we can safely utilize emerging knowledge to develop effective longevity-enhancing protocols. This review will only attempt to list the primary functions of key histone and non-histone proteins deacetylated by Sirt1 and those of the key enzymes regulated by sirtuins 3-5 (a.k.a., the mitochondrial sirtuins). Calorie restriction / Sirtuin activators, eg. resveratrol / Exercise2 —all increase sirtuin enzyme expression and activity, thus modulating numerous longevity-promoting cellular functions. SIRT1 and its enzymes act as a cellular redox /energy sensor, responding to the current state of the cell by deacetylating a wide array of pivotal metabolic transcription factors that modulate insulin secretion, gluconeogenesis, mitochondrial biogenesis and fatty acid oxidation, endothelial function, lipid metabolism, cell cycling, apoptosis and autophagy. Peroxisome proliferator-activated receptor gamma SIRT1 (PPARγ) deacetylation by Sirt1 results in repression of transcription of its target genes that are involved in fat storage. Upregulation of SIRT1 in differentiated fat cells triggers lipolysis and results in decreased fat storage in white adipose tissue. The FOXO (Forkhead Box class O) proteins are a family of transcription factors that regulate genes involved in cellular catabolism and renewal. Through complex modulation of at least three of the four mammalian FOXO transcription factors, Sirt1 stimulates autophagic degradation in a way that enhances cellular cleansing to ensure that waste products do not accumulate as the cell ages. Sirt1 stimulates FOXO transcription factors that increase autophagic degradation of targeted proteins, while also controlling resistance to oxidative stress and increasing adipocytes’ production of adiponectin; that latter results in increased lipid catabolism, gluconeogenesis, triglyceride clearance, insulin sensitivity, and inhibition of adipogenesis.181920 Sirt1’s interactions with the FOXO family also promote longevity via modulating immune function. (See below: FOXO: Modulating Immune Function to Support Stress Resistance and Neuroprotection) For a full discussion of the central importance of autophagy for longevity, please see our LMR review, Beyond the Mitochondrial Tune Up: Part III. Two examples (immediately following) of such feedback loop interactions are provided by Sirt1’s interactions with Rb/E2F1and c-Myc. Further evidence that Sirt1 is not oncogenic is its deacetylation/suppression of p73, which is highly expressed in many tumors typically found in humans, including in breast and ovarian cancer, and is now thought to be an oncoprotein. Adenoviruses (so called because they were first isolated in the adenoids and are responsible for ~5-10% of respiratory infections) that cause cellular transformations also increase p73 expression. Deregulated over-expression of transcription factors involved in cell cycle progression (e.g., E2F-1, whose inhibition by Sirt1 is discussed above ), induces the expression of p73.2728 In sum, it’s a complicated web, but one in which SIRT1 and Sirt1 appear, overall, to not promote cancer. Still, this remains an area of controversy and on-going discovery. Flow chart adapted from Vijg J, Maslov A, Suh Y. Aging: a sirtuin shake-up? Cell. 2008 Nov 28;135(5):797-8. Sirt3 binds to complex I in the electron transport chain (ETC), regulating its activity and energy levels in the cell. Sirt3 also binds and deacetylates acetyl-CoA synthetase 2 (which joins acetate and coenzyme A to produce acetyl-CoA for use in the Krebs cycle) and glutamate dehydrogenase (GDH, converts glutamate to α-Ketoglutarate, an intermediate in the Krebs cycle). Sirt3 deacetylation activates these enzymes. In cardiomyocytes, Sirt3 levels are elevated in both the mitochondria and nucleus. Sirt3 also promotes cellular longevity by preventing apoptosis while acting as a tumor suppressor. Sirt3 deacetylates Ku70, preventing Bax activation, which triggers apoptosis. 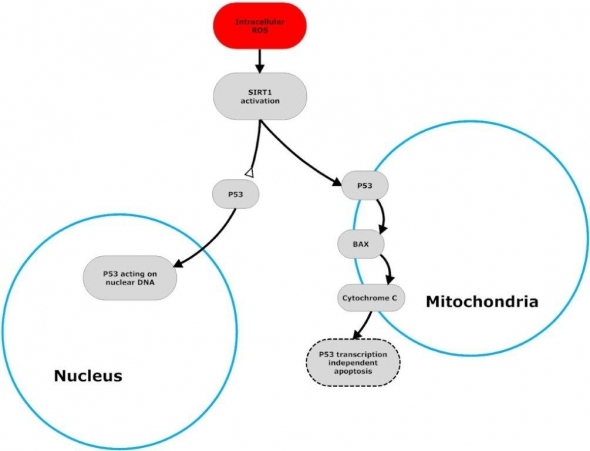 Most recently, Sirt3 has been shown to be a mitochondria-localized tumor suppressor that works its anti-oncogenic magic by enhancing expression of mitochondrial MnSOD (a key mitochondrial antioxidant that reduces superoxide, a highly promiscuous free radical produced as a byproduct in ETC reactions).303132 For a full discussion of mitochondrial energy production, please see our LMR review: Beyond the Mitochondrial Tune Up, Part I.
Quinone reductases are cytosolic flavoproteins (proteins that contain flavin adenine dinucleotide (FAD), a derivative of riboflavin), which catalyze the reaction that recycles NADP(H) to NADP+, thus playing a role in maintaining healthy cellular redox potential. Quinone reductase 2 has recently been revealed to be a key upstream factor integral to the inhibition of NFκB. Resveratrol’s upregulation of QR2 is thought to be one mechanism via which resveratrol regulates NFκB.343536 And given our above discussion of the pivotal importance of NAD+ salvage for sirtuin activation, this is also another mechanism through which resveratrol boosts sirtuin activity. This field is new—but the data accumulated is already substantive and points to a very bright future for longevity medicine given what we already know about the sirtuins: (1) Sirtuins act as sensors of the metabolic state of the cell and organism. (2) Sirtuin activity is controlled by the cellular NAD+:NADH ratio and is therefore responsive to changes in cellular metabolism.40 (3) Perhaps the key reason why CR results in activation of the sirtuins: CR lowers metabolism and oxidative stress, increasing availability of NAD+.26 (4) In addition to CR, sirtuin activity can be upregulated by resveratrol and a number of other xenohormetic plant compounds. We have entered a new era in which the key genes and intracellular pathways responsible for aging and longevity have been identified.41 Lifespan is tractable, and we now know enough to begin utilizing emerging knowledge to develop effective longevity-enhancing supplements and protocols.